Check it out: Longtime Capital Region journalist Michael DeMasi has a book coming out that's based on the many stories he's covered around this area. A salvager who bought downtown Albany's biggest, ugliest building. An Irish priest lifting spirits at a maximum-security prison. A wealthy socialite whose 40 dogs eat organic chicken. A laid-off farmhand temporarily working as a human billboard. An upstate New York mayor who became the Pied Piper of Guyanese immigrants. A friendly clock enthusiast named Smiley Lumpkin. They are some of the people Michael DeMasi has interviewed during more than 25 years in journalism. He shares what they and many others said in this collection of his favorite stories. 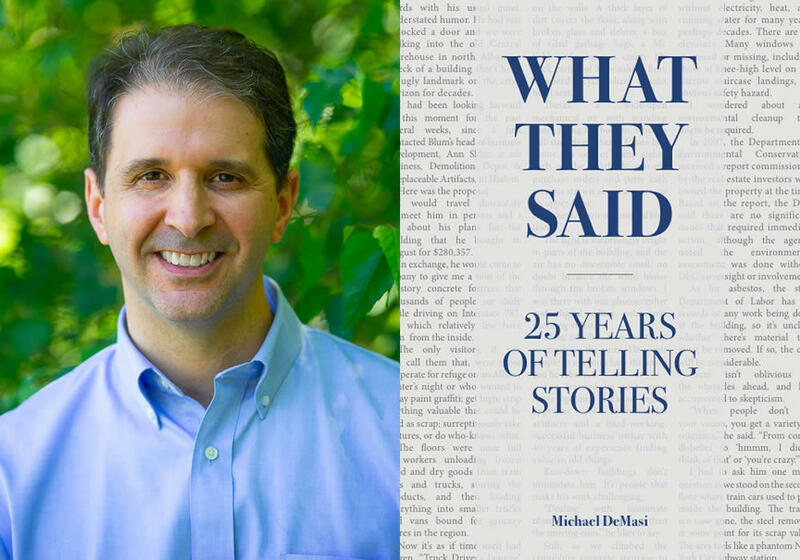 What They Said will be available to buy starting next week at Market Block Books in Troy, The Open Door Bookstore in Schenectady, and The Book House of Stuyvesant Plaza, and online the following week from Troy Book Makers and Amazon.